One of the top reasons that families work with me is because their child is waking frequently at night. In most cases I find that the child is fed each time to put them back to sleep, which is creating a bad habit of night waking’s and/or short naps. I have seen this with children as young as four months and as old as 3.5 years. Here are some tips I provide parents who have fallen into this trap. There are some general guidelines around feeding that I recommend parents try to stick to, unless otherwise instructed by a doctor, for example, a concern about your child’s weight gain. 0-2 Months Feedings every 2-3 hours during the day and night. This can mean as many as five night feedings. 3 Months Three night feedings, first stretch is about 5 hours long. 4 Months Two night feedings, first stretch is about 5 hours long. 5 Months Two night feedings, longest stretch is 6 hours. 6-7 Months One night feeding, longest stretch is 6-7 hours. *In order for baby to go longer than 6-7 hours at night solids need to be well established, meaning three meals per day consisting of all four food groups in addition to milk. 8-9 Months This is the average age that babies will drop all night feedings. 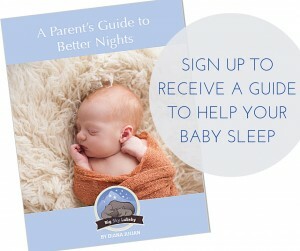 They may be an occasional night feeding, but children are able to sleep through most nights. The best way to address the issue of your child waking out of habit is to teach them how to put themselves to sleep. Once they learn to self-soothe, they will no longer look to you (or food) to help them fall back to sleep. When a child wakes out of habit and has not yet learned these skills, they think they NEED help returning to sleep. Once they learn how to do it themselves, they will begin transferring themselves from one sleep cycle to the next without looking for help from Mom and Dad. The majority of people who seek my help will report that their child is taking 30-45 minute naps, which is because that is the length of one sleep cycle. Once they are taught to self-soothe, they will extend their naps by putting themselves back to sleep during brief wakings. How do I know if my child is waking because of habit or hunger? During the newborn stage, it is expected that your child will wake frequently. As they grow it’s important to be able to differentiate if their waking’s are out of habit or hunger. Your child is falling asleep independently at the beginning of the night and still waking up. Your child falls back to sleep quickly after a feeding. Your child is eating and then sleeping a good 3-4 hour stretch. If your child is stuck in a pattern of eating too much at night and not taking in enough calories during the day. If your baby does not get a feeding and they stay awake crying for an extended period. Your child is fed and continues to remain awake. You always put your child to sleep by either feeding them or rocking them to sleep. If their sleep environment is not conducive to sleep. Things such as night-lights, crib mobile, the room being too hot or too cold, or too much sunlight could be creating a habit of waking. Learn more about creating a sleep environment conducive to sleep in this blog. Like all bad habits, this too can be reversed. It just takes time and consistency.